There are 3 different approaches for teaching “Jewelry Making and Design”. Each approach makes different assumptions about the process of making jewelry and about the skills/ abilities/ and capabilities the jewelry designer will require. It’s important to understand how you are being taught and led – that is, where the teacher (or how-to author) is coming from – so that you can appreciate what the teacher is saying and trying to accomplish, and how this may or may not apply to your own goals as a jewelry designer. By far, the most typically-encountered approach is called the Craft Approach. Here you are taught a set of specific steps to follow in order to complete a very defined project. You might be expected to follow a set of step-by-step instructions in a class or read a pattern in a book.You are not taught how to apply those steps to any other project. You are not taught the consequences for choosing one type of bead or clasp or stringing material over another. You are not provided any kind of evaluation about the steps — for example, are they clear, well-written, relevant, pertinent, user-friendly? You find the Craft Approach taught most often in a bead store or crafts store, or as the basis of how-to books. These stores are in the business of selling classes, books and kits — basically, selling you “STEPS”. If the student has difficulty completing the steps, the Crafts Approach teacher usually suggests going back and re-doing the steps, buying another book of more steps, or taking another class to learn more steps. Some students enjoy learning from this approach. It’s relatively straightforward. It’s easy. There’s no pressure to create “Art”. The only challenge is to finish. You don’t have to make a great commitment to the craft. You can concentrate on having fun. 1. That you are either born with creative talents or are not. They can’t be taught in any way. 2. The only thing that matters when stringing is to complete the task. 3. Jewelry is a craft that anyone can do. It is not art. c. The jewelry artist is taught to start with a set of instructions or a pattern. d. Not concerned that the beader truly learn anything. A better beader is one who does more and more steps (that is, follows more and more patterns). In most of the places that teach from a Craft Approach, the primary concern tends to be selling kits and beads and collecting class fees. e. Easy to define an acceptable outcome. Easy to respond to a student who says s/he doesn’t understand the directions for the project. Tell them to go back and re-do the steps, or take another class to practice some additional steps. A second approach to teaching jewelry design is called the Art Tradition. If you were studying beadwork or other fine crafts at an art school or most jewelry design programs or community college or university, you would probably be taught from the Art Tradition. The Art Tradition believes that you need to learn a set of rules that you can use to apply to any situation where you are making jewelry. Artistic expression cannot be learned as a set of steps. It is less important that you follow a set of steps. It’s more important to know how to apply art theory to your project at each stage of the process, whatever that process is, and wherever that process takes you. The types of rules you are probably most familiar with are those involving color. What colors go with each other? Which colors are “spring” and which are “fall”? There are also rules involving texture/pattern, shape, balance and harmony, distribution of sizes and colors, interplay of light and shadow, perspective, dimensionality, and the like. These art theories detail what defines successful (and unsuccessful) manipulation of design elements within a piece of art. The Art Tradition, however, very narrowly defines what it considers an acceptable medium for art work. “Jewelry” is understood either as a subset of painting or a subset of sculpture, and subjected to those theories only. “Jewelry” is not seen as its own discipline and medium, with its own special rules, theories, techniques and approaches. Art, Jewelry Design and Fine Craft programs teach from this perspective because they are in the business of selling classes where they teach art THEORIES. The student is encouraged to learn more and more theories, and to experiment with different ways and strategies for applying them. The Art Tradition views jewelry as a subset of either painting or sculpture. There need not be special jewelry design classes, per se, because learning theories from painting or sculpture is sufficient. Achieving “beauty” is paramount. What matters most is how successfully the student has incorporated art theories within the final piece — as it sits on a pedestal or rests on a mannequin. Thus you see in magazines, galleries and museums, many pieces that are visually stunning, but often not wearable. For example, the bracelet with spikes that would kill the wearer, should she let her arm down; or the ring that would never stay upright on the finger in real life; or the 35 pound necklace that would drag the wearer down by the neck. What is nice about the Art Tradition, is that the goal is Beauty. The artist is not encumbered by having to follow specific steps or patterns. Nor is the artist encumbered by the structural and functional properties of all the pieces she or he uses — only their beauty. The artist does not have to compromise Beauty for Functionality. 1. While different people have different creative abilities, everyone has some creative ability, and can be influenced in how to apply these creative talents. 2. What matters in bead stringing is how you approach the process. If you apply the rules correctly at each step of the way, your end result will be a very beautiful necklace. 3. Jewelry as art is really a form of sculpture, and should be judged by the rules of sculpture. The focus is on how you think through the process. There is no concern about following a set of steps. It doesn’t matter if the jewelry sits on an easel or on a person. b. The beauty of the piece, as if it had been painted or sculpted, is paramount. c. The jewelry designer is taught to start with a palette of colors and textures. d. The beader should focus on the process of making jewelry. More insights about the process (meaning how to apply rules of art theory) makes a better beader. e. An acceptable outcome is one that is beautiful and appealing. It doesn’t matter what specific steps you went through to create your jewelry. It matters how well you applied the rules of art theory. It doesn’t matter if the piece would hold up or wear well, as it is worn. A third approach to jewelry design is what we teach at Land of Odds, Be Dazzled Beads and The Center For Beadwork & Jewelry Arts – the Art and Design Tradition. This approach isn’t widespread. This approach began in schools of architecture. These schools originally were departments in Schools of Art. Their students were initially taught in the Art Tradition. They designed and built buildings and bridges, without thinking about and dealing with how people, cars, the weather, and the surroundings and context interacted and were mutually interdependent with, with-in and with-out these buildings and bridges. These buildings and bridges often turned out to be “failures”. People couldn’t find the entrances, or the elevators. Buildings, like one in lower Manhattan, were set on vast plazas that people were afraid to walk across. Ultra-modern buildings were set in the middle of historical districts. Buildings suffered the fates, such as when the John Hancock Tower in Boston lost all its window panes to the winds, or, in the high-rise apartment building in Chicago, where residents replaced the installed white drapes with those of various colors, and “ruined”, at least from the architect’s point of view, the outside aesthetic. Bridges, like one in Tacoma, Washinton, undulated in the wind and collapsed, or other bridges that had to be closed to small cars for fear of them blowing off. Aesthetics were more important than functionality and usability and workability and durability and environmental fit and appropriateness. Buildings and bridges were judged as models sitting on a table, or three-dimensional images depicted on a computer screen. “Departments” of Architecture rebelled, and became “Schools” of Architecture. And hence, a new teaching philosophy – Art and Design – was born. Design was merged with Craft was merged with Art. The Art and Design Tradition believes that you teach steps, like in the Craft Approach, and you teach rules, like in the Art Tradition, but that you approach teaching and learning from a developmental perspective. That means, that certain steps and rules should be learned before others, and that continual learning keeps building upon itself. The focus is on the process of construction, so a lot of attention is paid to all the parts, and how they should be chosen, how they should/could and shouldn’t/couldn’t be used, and how they may or may not be integrated within the whole. The development approach is centered on first teaching a core set of skills, then another set of skills, and how these link back to the core. And then a third set of skills, and how they link back to the second set, and back to the core. And so forth. The Art and Design Tradition is very relevant for the education and training of jewelry designers, as well. Here, the Jewelry Artist is seen as a multi-functional professional, similar to an engineer who designs and builds bridges. The jewelry designer must bring a lot of very different kinds of skills and abilities to bear, when constructing a piece of jewelry. The professional has to be able to manage artistic design, functionality, and the interaction of the piece with the individual as well as that person’s environment. This approach also believes that “Jewelry as Art” should be appreciated as it’s own discipline – not a part of sculpture or painting. And that Jewelry can only be understood as Art as it is worn. 1. Everyone has creative abilities, but for most people, these need to be carefully groomed and attended to. Expressing creativity is not a matter of turning a switch on and off. It’s a process that can be influenced by ideas and situations. The challenge is to teach people to become more intuitive in expressing their creative abilities and ideas. 2. 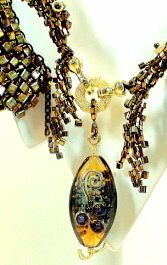 What matters in bead stringing is that your project be judged as a work of art. In this case, the definition of “art” is specific to jewelry and it’s design, in anticipation of how it will be worn. the piece, when worn, influences this sense. a. This approach focuses on design issues. Functionality, wearability, durability, context, movement are all key considerations in selecting parts and interrelating these parts in a design. Very concerned with how you select parts and materials. b. The beauty of the piece involves it’s construction, it’s lay-out, it’s consistency with rules of art theory, and how it holds up (physically and aesthetically) as it is worn. The focus is on how you organize your construction, piece by piece. The beader needs to bring many talents to bear in order to achieve a successful outcome. Here the beader is similar to an architect or engineer. c. The jewelry designer is taught to start, not only with a palette of colors and textures, but of parts and components, as well. d. More experience – especially learning skills developmentally – are required to be a better beader. You learn how skills and techniques are interrelated. You start with a core set of skills. Then you build upon these, and learn how to link your new set of skills to the core. You learn the next set of skills, and link them back to the second set, and link them back to the core. e. An acceptable outcome is one where the piece of jewelry maintains a sense of itself as art, as the piece is worn. the Art and Design Tradition is systemic. I am so loving this… It’s wonderful finding my own philosophical approach in a group of instructors. I look forward to learning a great deal and finding evermore joy in the spirit of creation. Thank you so much. great post, I enjoy reading it. I hope 1 day I may obtain the same. thanx.